While compact discs (CDs) are remarkably durable, it's nearly impossible to prevent scratches and scuffs from occurring from time to time. The resulting damage can be either a skip in your favorite Bob Marley track or, in the case of data CDs, the loss of that spreadsheet you worked on for two weeks. Don't despair—repair! While commercial CD repair kits and CD refinishing machines are available, you may be able to repair the damage on your own with products you already have. Here's how. 1. Clean the disc. Even if a CD isn't actually scratched or scuffed, dust, oil, and other surface contaminants can prevent it from playing properly. Thus cleaning the disc should always be your first move. Run warm water over the damaged disc to remove dust. If there is stubborn dirt or grease on the disc, gently rub it with your finger while you are washing it, and use a gentle detergent (with the water) or rubbing alcohol (in place of water.) Anytime you rub or wipe a CD, you should do so by starting at or near the center of the disc and rubbing straight outward toward the edge to prevent further scratching. Shake the water off and let the disc air-dry (do not dry it with a towel or cloth). 2. Try to play the disc. Many times a good cleaning is all that is needed. If, however, problems persist after cleaning, try to play the disc in a different CD player. Some players handle scratches better than others; computer CD drives tend to be best. 3. Burn a new disc. If you can get the CD to work in one CD player — especially your computer's — but not in others, try burning a new disc. 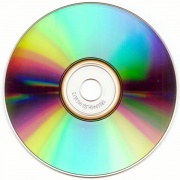 The CD burning utility on your computer may be able to read the CD well enough to produce a perfect copy. You may wish to try this even if the CD doesn't play correctly on the computer. 4. Locate the scratch. Actually repairing the disc will be easier if you can figure out where the offending scratch is. Visually inspect the CD's playing surface for scratches or scuffs. Scratches that run perpendicular to the CD's spiral — that is, those that run generally from the center to the rim — may not affect playing at all, and in any case are generally less damaging than those that roughly follow the direction of the spiral.